When a basic manicure just won't do, it's time to think outside the box. This neon design is edgy, streetwise and full of vibrant colors. If you've ever dropped a bottle of nail polish on a hard floor, then you've already witnessed the end result. This design has the same effect, but there's a trick to getting it right. 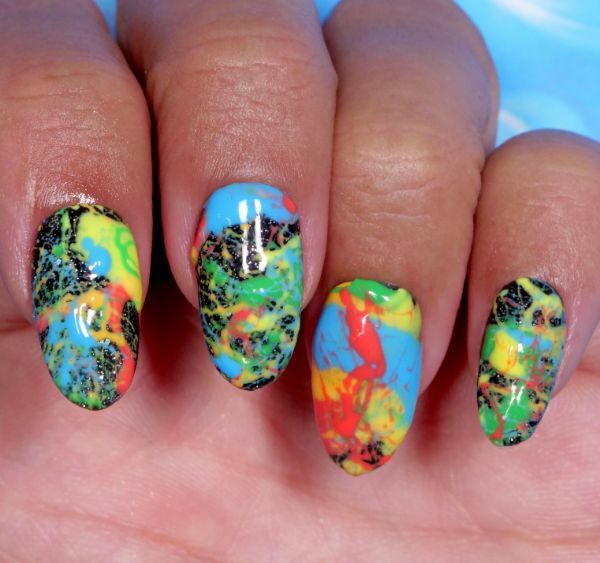 This multicolored manicure isn't painted on; it's blown on. 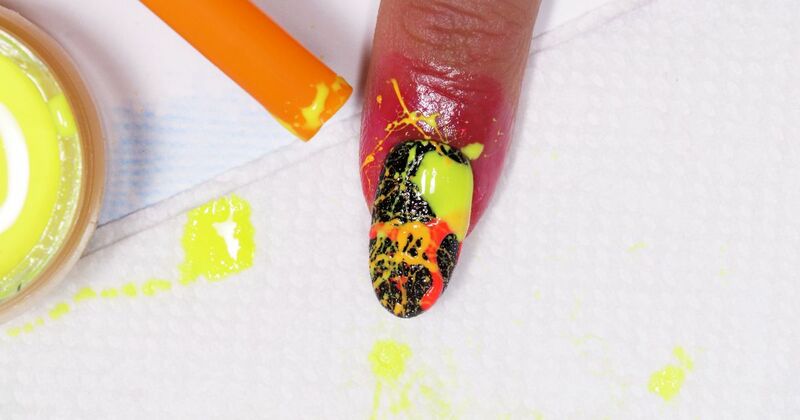 By dipping a flexible straw into the nail paint then blowing through it, the paint is forced out in one quick blast. Tip: Keep your work area clean by laying paper towels on it before you start. 1. Apply one coat of black gel polish to the nails, then cure them with the UV or LED lamp. 2. Apply latex tape peel off cuticle guard to the skin around the nails. 3. Apply a second coat of black gel polish to the nails, then cure them with the lamp. 4. Apply one coat of glitter gel polish to the nails, then cure them with the lamp. 5. Lay paper towels on your work surface to keep it clean during the next step. 6. Dip the straw into the orange paint, then blow through the straw to deposit the paint on the nail. Use the scissors to cut off the end of the straw before changing colors. 7. Repeat step six with each additional color, then cure the nails with the lamp. 8. Apply one coat of gel top coat to the nails, then cure with the lamp once more. 9. Remove the cuticle guard with the tweezers. 10. If there is any paint on your skin, remove it with an acetone-soaked cotton swab.